Mayor Walsh testifies alongside Easthampton Mayor Nicole LaChapelle, Framingham Mayor Yvonne Spicer and Lawrence Mayor Dan Rivera. BOSTON - Friday, March 22, 2019 - Mayor Martin J. Walsh today offered testimony before the Joint Committee on Education at the Massachusetts State House in support of comprehensive education finance reform. 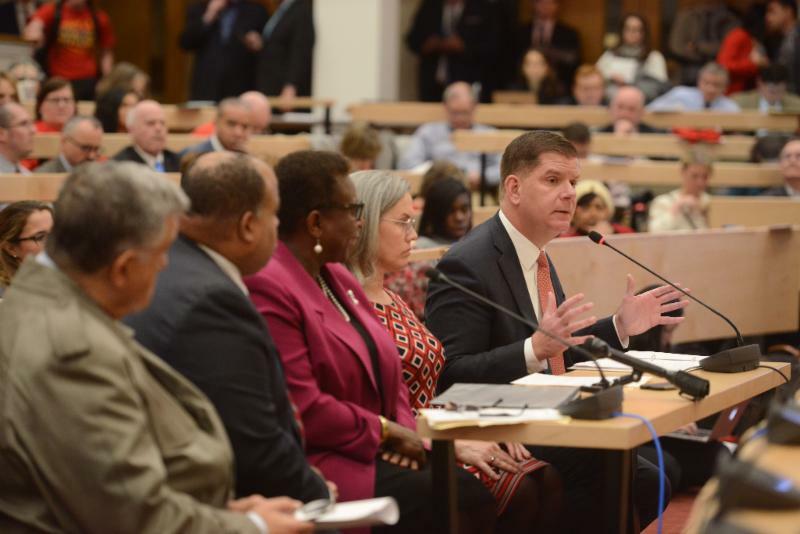 Alongside a panel of mayors and city leaders from across the Commonwealth, and with the support of dozens of others who stood in support of reform, Mayor Walsh called for everyone to stand in unity for a reform that works for every student, every district and every community in the Commonwealth. Thank you, Chairwoman [Alice] Peisch. Thank you, Chairman [Jason] Lewis. Thank you to all the members of the Committee. Modernizing education funding is among the most important tasks that you as leaders will undertake for Massachusetts. I know you will approach it thoughtfully, and I'm proud to have once served alongside you as a colleague. I'm here today to offer my support to you in this work. And I'm here to let you know what it means to the City of Boston and the young people in our schools. I'm grateful to be here with my fellow mayors: Mayor Nicole Lachapelle of Easthampton, Mayor Yvonne Spicer of Framingham, and Mayor Dan Rivera of Lawrence. I would like to acknowledge the many other mayors who are here with us today. We represent different cities, counties, regions, and school districts across the Commonwealth. In the past, our differences kept us apart, advocating for our own interests. Today, we come together, because we believe all of our young people are equally deserving of a 21st-century education that meets their unique needs and prepares them for a bright future. We come together around the principle that funding education is a partnership between the Commonwealth and all its communities. It's not a backstop. It's not a bonus. It's not a handout. It's a partnership embedded in our State's Constitution, as a duty we owe to every child, in every city and town. That's what the Court ruled, and the Legislature enacted, in 1993. And with the changes the world has undergone in the last 26 years, it is even more true today. We must work together to understand what our young people need and we must work together to fund it. Here's why this partnership is so important for the City of Boston and to me. It's the nearly 55,000 diverse, resilient, talented students who are sitting in Boston Public Schools classrooms across this city right now. 47,000 of those students are young people of color, that's 86% of our student body. Our students face economic disadvantage at twice the statewide rate. Our students are English language learners at three times the state average. And, if you look at all the students in Massachusetts who have multiple challenges-who face poverty, language barriers, and disability at the same time-the Boston Public Schools serve 43% of those students for the Commonwealth of Massachusetts. In other words: if Boston is left out of the education funding partnership, then nearly half of these highest-needs students in the state will be left out as well. If reform is something we do every 26 years-once a generation-then in this generation, we cannot leave any of our young people out, least of all our most vulnerable students, whether they be in Boston, Holyoke, Lowell, Haverhill, Pittsfield, or any other community. If we are serious about closing achievement gaps, those students must be at the heart of this conversation. What that means, in practical terms, is this: any reform must fully implement the recommendations of the Foundation Budget Review Commission; and, it must guarantee State partnership, to fund those foundation budgets with a basic level of funding every district can count on. In Boston we are proud to be a growing city. We are not asking for the same breakdown of resources as a Gateway City, or a community on the Cape, or a town in the Berkshires. We are asking that the state fulfill its responsibility to partner with us to fund the education of our students. For Boston, and a number of other cities and towns, that means the state must take into account the actual funding available for districts after accounting for charter school costs. There is more than one way to achieve these goals. We welcome the conversation. But the final legislation must make sure every district can rely on state partnership. Otherwise, if no minimum funding is included in this reform, then in two years our Chapter 70 education aid will fall to zero, and it will not matter how much we are growing as a city. After that, the Commonwealth will deduct charter tuition from our Unrestricted General Government Aid (UGGA), which we use to fund city services like public safety, affordable housing, parks, transportation, and climate resiliency. This would spell the end of the state's education partnership with its largest district and a divestment by the Commonwealth in the capital city and its children. That's what's at stake for Boston. But we're not alone. Cities and towns across the state face similar declines and similar dilemmas. That's why we are standing together for a solution: a solution that's inclusive, a solution that's affordable, and a solution that would finally take politics out of the conversation, so we can stop pitting city against town, district against charter, legislator against legislator, and start meeting all our students' and communities' needs. This formula is complicated, but the issue is not. Every young person, in every community, deserves a full opportunity to learn, to dream, and to thrive in our 21st-century world. Thank you for your time. I stand ready to move this conversation forward in whatever way I can.